Governors work with senior leaders in the strategic development of the school and in raising standards of achievement. Duties include setting the school’s vision, aims and objectives, approving the school budget and appointing the headteacher. I have been Head Teacher at Elm Grove Primary School since September 2014. It is my second headship, prior to this I was the Head Teacher at Carlton Hill Primary School for 7 years. I trained in Brighton and qualified as a teacher in 1982. I have taught across the primary age range since then in 9 primary schools in Brighton, East Sussex and Australia. My daughter started Elm Grove in 2007 and my youngest child is now at the school, so I have had a connection with Elm Grove for a long time. I have worked as a Business Consultant in the Financial sector, an Account Manager in the Charity sector and am now in the Welfare team of a College for primarily international students. I hope to bring experience from the sectors I have worked in, as well as my experience as an Elm Grove parent over many years, to help the school continue to provide a safe, nurturing and rewarding educational experience for the children in our community. My eldest daughter joined Elm Grove in 2014 and my youngest started in reception in 2018. In my day job I manage big partnerships and projects for international charities – I’m currently with Sightsavers after long stints with WWF and UNICEF. As a governor I’m enjoying the opportunity to play a more active role with the school and my local community. I joined the Governing Body at Elm Grove as a Co-opted Governor in September 2015. I have also been a governor at Carlton Hill Primary School since I retired from a career in primary education in 2010. During this career I have taught in Australia, Brighton and East Sussex and have been a headteacher in West Sussex. I have worked at Elm Grove for the past 18 years. My children attended Elm Grove and have fond memories of their time at the school and still have the ethos that the school has of kindness and inclusion for everyone that drew me, as a parent to the school. My husband, who also came to school here, was an elected parent governor at our school, he enjoyed his time as a governor and suggested that I too would enjoy becoming a governor, I do. Being a staff governor has given me another layer into Elm Grove which I have found fascinating and I hope that my input into the governing body is useful. I became parent governor in November 2012. My first child started Elm Grove in 2006, and my youngest is currently in year 5. I work as Vice-Chair of the Parent Carer’s Council (PaCC), representing parents and carers of disabled children in Brighton and Hove. I also volunteer in various roles, including as a Scope Face2Face befriender, supporting parents of children with special educational needs and disabilities. I live in the community and catchment area of Elm Grove and have been a staff governor on three occasions as well as being a parent governor at my children’s school. A career working in a multidisciplinary team setting has developed my expertise and understanding of how schools can become successful communities, with relationships between adults and children being fundamental to effective learning. This guiding principal has been underpinned by a strong skill set in behaviour management techniques, restorative justice, mentoring as well as an understanding of SEN provision. I’m a parent of two kids at Elm Grove. Our eldest started in 2012 and our youngest will leave in 2023, so I understand the school and the education system a lot more than I did, and I’m really looking forward to playing a role to help the school navigate the many challenges it faces as it tries to give kids a good education. My background is in community engagement and fundraising. I worked as a Social Worker in Children’s Services and Youth Offending Teams, where I was the Education Officer, for many years. I now do the administration for my husband’s IT Consultancy and gained the AAT Book keeping qualification to fulfil the requirements of this position. I have been a Governor and found the position challenging, fascinating and very rewarding. The importance of education is a key element of my life experience. I am particularly committed to optimising educational opportunities for children from disadvantaged backgrounds. The full governing body meets once or twice a term. At these meetings, the governing body carries out its 3 core functions, as identified by the Department for Education in the Governance Handbook. The current chair of governors is Diana Boyd. Some functions are delegated to committees. 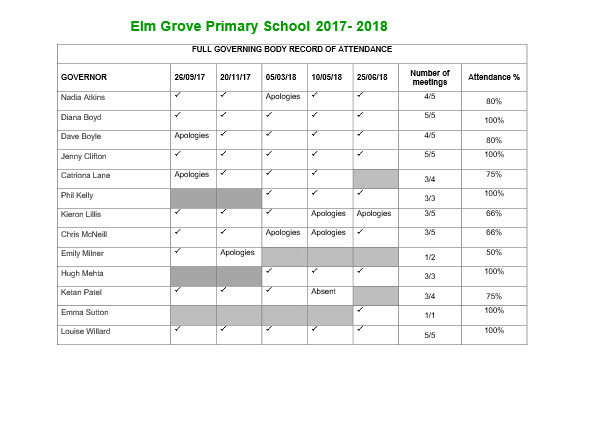 Elm Grove Primary School has three committees.